Olive leaf extract was found to enhance thyroid function as it helps with the conversion of T4 into its active form T3. Therefore, it boosts the levels of T3. It was found to stimulate the thyroid gland in animal study (1) in a dose depended manner. 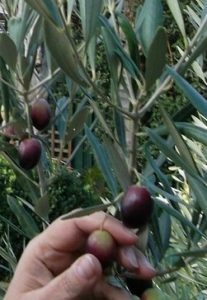 Olive leaf extract contains many health beneficial molecules including oleuropein and hydroxytyrosol and flavonoids (rutin), polyphenols (apigenin, luteolin) among others. The molecule hydroxytyrosol in olive leaf was shown to inhibit pro-inflammatory molecules such as IL6 and TNF- alpha in mice studies (8) and in human studies (9, 10). It also reduces many other inflammatory molecules. IL6 levels were found to be high in post- menopausal women with Hashimoto’s thyroiditis (5). Also, a study in animals (6) showed that autoimmune thyroiditis could be prevented by blockade of IL6. One of the problems in Hashimoto’s thyroiditis is the high level of inflammation which interferes with the conversion and action of thyroid hormones. Patients with Hashimoto’s thyroiditis are often on high doses of thyroid hormonal replacement. One of the reasons for that is to counteract the effects of inflammation in their bodies. Olive leaf extract may help to reduce these thyroid blocking molecules. Hydroxytyrosol in olive leaf is a powerful free radical scavenger, protecting the energy houses in cells called mitochondria. It is believed to be protective for the central nervous system. Other positive effects of olive leaf extract (among many others) are reported to be: reduction of blood pressure, anti-microbial and anti- bacterial, anti-fungal activities, anti-parasitic activities, anti-carcinogenic effects, lowering blood sugar and cholesterol, powerful anti-oxidant activities (believed to be more powerful than vitamin E), beneficial for cardiovascular system, eye health, helping with allergies, asthma, colds, protecting against UVB radiation, benefits for people with osteoporosis, benefits for some autoimmune disorders, anti-aging, helps to remove heavy metals such as lead from the body and energy increasing properties. Olive leaf extracts are regarded to be quite safe. Effective dose of powdered leaf extract is likely to be 500-2,000 mg daily. It is available in capsules. Al-Qarawi AA, Al-Damegh MA, ElMougy SA. Effect of freeze dried extract of Olea europaea on the pituitary-thyroid axis in rats. Phytother Res. 2002 May; 16(3):286-7. Hao J, et al. Hydroxytyrosol promotes mitochondrial biogenesis and mitochondrial function in 3T3-L1 adipocytes. J Nutr Biochem. 2010 Jul; 21(7):634-44. Papanas N., Papazoglou D., Papatheodorou K., Antonoglou C., Kotsiou S., Maltezos E. Thyroxine replacement dose in patients with Hashimoto disease: A potential role for interleukin-6: Cytokine. 2006:35(3-4): 166-170. Lucyna Siemińska, Celina Wojciechowska,, Beata Kos-Kudła,, Bogdan Marek, Dariusz Kajdaniuk, Mariusz Nowak, Joanna Głogowska-Szeląg, Wanda Foltyn, Janusz Strzelczyk. Serum concentrations of leptin, adiponectin, and interleukin-6 in postmenopausal women with Hashimoto’s thyroiditis. Endokrynologia Polska/Polish Journal of Endocrinology; Jan-Feb 2010:61(1):112-116. Cao, K.; Xu, J.; Zou ,X. ;Li, Y. ;Chen, C.; Zheng, A.; Li, H.; Szeto, I. M. -Y. Hydroxytyrosol prevents diet-induced metabolic syndrome and attenuates mitochondrial abnormalities in obese mice. Free Radic. Biol. Med. 2014, 67, 396-407. Tzoulaki I, Murray GD, Lee AJ, Rumley A, Lowe GDO, Fowkes FGR. C-reactive protein, interleukin-6, and soluble adhesion molecules as predictors of progressive peripheral atherosclerosis in the general population. Circulation (2005) 112:976–83. Richard N, Arnold S, Hoeller U, Kilpert C, Wertz K, Schwager J. Hydroxytyrosol is the major anti-inflammatory compound in aqueous olive extracts and impairs cytokine and chemokine production in macrophages. Planta Med (2011) 77(17):1890–7.